I partnered with Boise on this sponsored post. All opinions are my own. Ryan & I both work online from home, so we have a home office. We actually have two printers because they have slightly different features that we occasionally like to take advantage of. We go through a decent amount of printer paper. We have family members who rely on tablets or their phone for internet now, so they don’t own laptops at all and have given up on having a printer of their own as well. It’s common for us to have a friend or family member call or text and ask if they can stop and use our printer really quick. We go through quite a bit of ink and paper. I’ve realized over time that not all paper is the same when it comes to quality. It can be tough to tell the difference when standing in the store, though. For example, look at how many aspects of these two packs of paper seem quite similar. Same number of pages, same size, same weight, etc. Holding one piece of each in each hand, I can physically feel a difference. Have you ever been at a business conference where you received a lot of business cards? Some are thick and sturdy, while others just feel like thick paper. There is a sturdiness and stiffness to Boise POLARIS that you notice right away. The other significant difference is Boise POLARIS is more opaque. 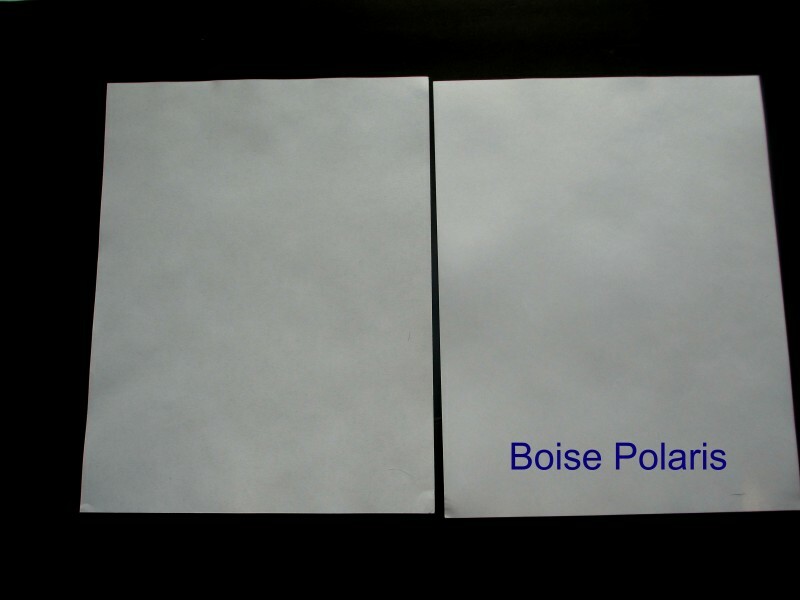 When putting both pieces of paper against a dark background, or holding both up to the light, the Boise POLARIS lets much less light through, and less of the background shines through as well. The difference is more noticeable in person than it is on camera. In person, the non-Boise paper has variation in opacity throughout the paper, giving it a slightly marbled look. Having opaque and sturdy paper looks and feels more professional, which is important to me when sending documents related to my business or Ryan’s business. Plus, opaque paper can be used on both sides, where paper that is more transparent is tough to read if printed on both sides. I don’t often print with color, but having an opaque paper helps colors pop off the page as well. 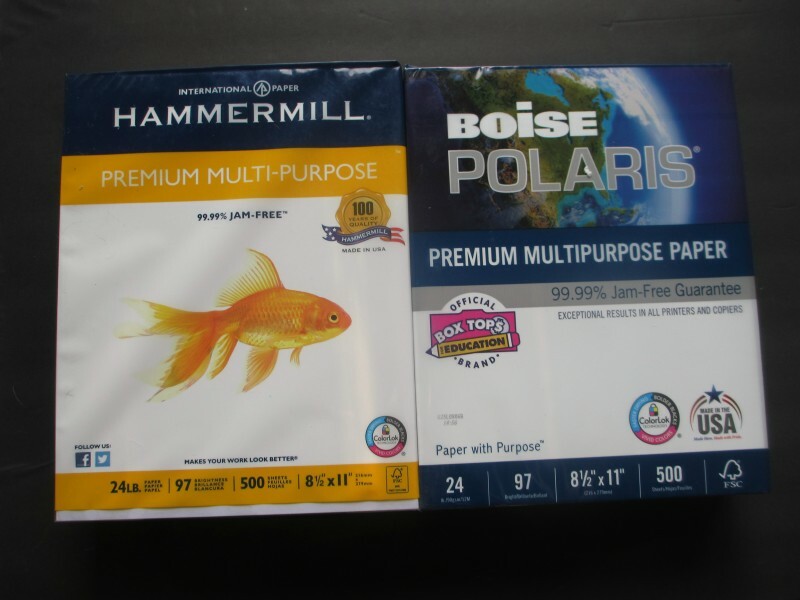 After trying these two types of paper side by side I have decided to stick with Boise Polaris. I like that it’s sturdy and opaque, as well as how it’s made in the USA and 99.9% jam-free. It’s even Forest Stewardship Council® (FSC) certified, because it’s made from wood fibers that came from a sustainably managed forest. You can find Boise POLARIS at Office Depot. It’s available in three weights – 20lb, 24lb or 28lb. The paper shown in this post is the mid-weight, 24lb. Love it!! It looks like amazing quality!! I hate thin and cheap looking paper, especially with professional print outs!! This looks like great quality paper, so I am going to try it when I need more paper! Thanks for a great review! This is good to know, next time I’m getting paper, I want to try Boise Polaris!